Do you like dogs? Then a dog walking service may be the perfect home business for you. A dog walking business can be a fun and profitable way of making money from home. 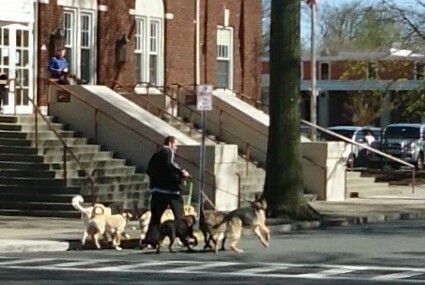 Also growing in popularity is dog running. Dog runners are professionals who will take your dog running, usually between 1 and 10 miles for a set fee, usually not more than 2 dogs at a time. In some jurisdictions dog walking businesses must be licensed and have animal first-aid-trained employees. Professional dog walking services can be obtained locally or through online referral services. In the United States, the first professional dog walker is believed to have been Jim Buck, who in 1960 launched his dog walking service in New York City. Buck operated his business for approximately forty years and, at its peak, employed at least 24 assistants. Before starting this home business you need to plan a few things. You need to work out your daily walks and routes. Find out where you can best walk the dogs and work out some good thirty minute routes. Decide on the type of dog walks you will offer – private or group walks, the number of walks per week and so on. A great deal of information about dog care and dog behavior can be found from books in your local library or relevant internet sites. If you are just starting out you can get some relevant experience by volunteering to walk dogs at local animal shelters and dog rescue centers. This will provide you with good experience in handling a number of different dogs and give you the confidence and credibility to find paying dog walking jobs. According to NBC News, Dog walkers earn $30,000 to six-figure annual incomes in these pet jobs, with averages around $40,000 to $60,000, estimates Veronica Boutelle, founder of DogTec.org, which offers several resources in running dog-related businesses. Dog walkers charge an average hourly fee from $15 to $25, depending on whether the dog is walked in a pack or alone. The most recent national survey posted a range from $19,923 – $70,469, will the main factors affecting salaries being experience and location. The national average is closer to $26,000 to $32,000 annually. Your start up costs are low. You may have to purchase a few good leashes, pooper scoopers and bags. The variable cost of advertising locally plus the possibility os a local business license and liability insurance are typically the only expenses making this an affordable start-up. Buying liability insurance is always advisable. Your business expenses are limited and there is good profit potential with a dog walking service. In addition you can stay healthy and fit while making money! Finding dog walking jobs can be done on a small marketing and advertising budget. Cost-effective ways to advertise your pet services include designing and printing eye-catching and informative flyers. Post these flyers around your neighborhood targeting potential clients. Don't forget your business cards. People likely to use a dog walker include busy professionals and elderly people so post flyers in office blocks and retirement communities. Pet owners going on vacation will often need a dog walker. Post your flyers on local community boards. Another useful place to post your flyers are veterinarian offices, pet grooming services and pet supply stores. Once you have your first clients you will be amazed at the number of referrals you get if you provide a good and reliable service. Job listings are available through online searches and include sites like payscale.com. A professional dog walker takes clients' dogs for regular walks, either one dog at a time or a few dogs together. Give dogs water, food and simple medication when requested by clients. Walk and sit clients' dogs. Ensure dogs are safe and properly cared for. There is a growing demand for these services as so many families have busy schedules and are away from home all day unable to exercise their dogs themselves. Exercise is an essential component of correct pet care and many people look to dog walkers to hep them out. There are many advantages to starting a dog walking service. The only real skills you need are a genuine affection for dogs and the physical stamina to walk the dogs. Commitment to your dog walk routine and reliability are essential. Walking dogs is a good way to earn income from home. It is fun, rewarding and keeps you fit and healthy! Since the cost of dog walking services is often equal to (or less than) the cost of doggie day care or boarding services, and the pet can be cared for at home without needing to be transported to and from an outside facility, the demand for dog walkers is expected remain strong for the foreseeable future. Cities will tend to be the strongest market for dog walking services since the dog population is especially concentrated in these areas. Dog walking and sitting can be combined for better pay, and this option should be a strong business opportunity for the years to come.